CallmeRoger.com: My Car is 288,000 Miles Old Already! 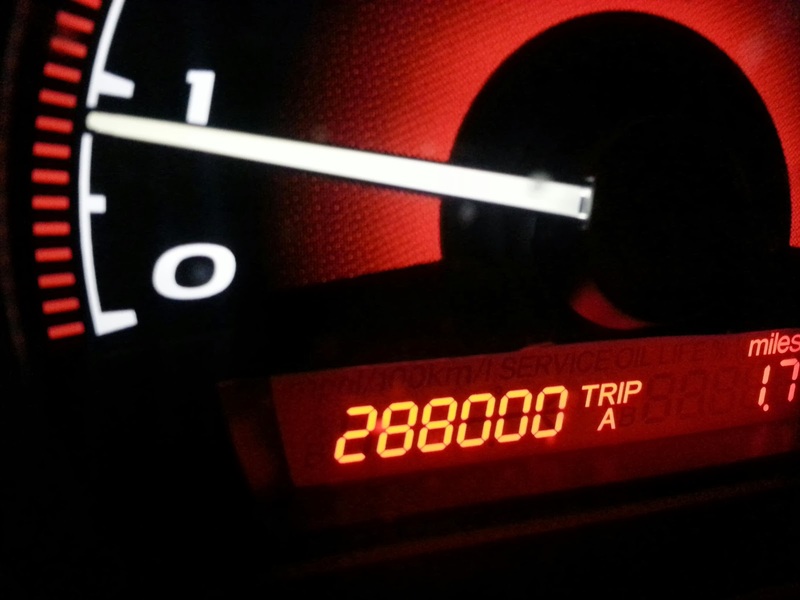 288,000 Miles Driven on my 2008 Civic Si. When I bought this car, I knew that it's main purpose is for work. The braking system, suspension, power, and what I call fun factor was evidently in this car. Basically, I made "working" or "doing deliveries" fun for me! This is also where I spend more than 80% of my time working. Transmission failed on me during my deliveries at 189,941 miles. It took two weeks to repair and about $4,700 to repair. The alternator was recently replaced, at 287,900 miles. If it was replaced before, I don't remember, nor do I have any transaction records of it. Ok, this was a surprise to a few of my friends. I do remember replacing the starter back on November 2012. Exterior: The back bumper, and both left and right side panels, have been replaced during Winter of 2013, after getting side-swiped and hit on three different occasions at one of my delivery sites. The total cost of repairs came out to $4,800. All of which was paid for by two different major companies that were responsible for causing the damages.